I love eating scones for breakfast, especially when they're warm from the oven. These Cranberry Oat Scones are perfect on chilly mornings, as their texture is hearty due to the addition of rolled oats. There are no eggs in this scone recipe and instead of milk, I've used buttermilk, which gives the scones a more bread-like texture. I've also flavored the scones with orange zest and dried cranberries, but you could use dried cherries, raisins, or currants. If you are not familiar with buttermilk, it has a nice thick creamy texture with a rich tangy buttery taste that makes baked goods tender. It is now commercially made by adding a bacteria to whole, skim, or low fat milk. However, in the past it was the liquid left over after churning butter. You can a very good substitute at home by adding 1 tablespoon of white distilled vinegar, cider vinegar, or lemon juice to 1 cup (240 ml) of milk. Let stand about 10 minutes at room temperature before using. Another alternative is to use buttermilk powder. Oats are a cereal grain that is rich and flavorful and comes in many forms. Very popular in Northern Europe, Scotland and Ireland. Oats to be consumed by humans are cleaned, toasted, hulled to become what we call oat groats. The oat groats are then steamed and flattened to become rolled oats or old-fashioned oats. They take about 15 minutes to cook. Old-fashioned rolled oats are not to be confused with quick-cooking rolled oats. These are oats have been cut into pieces before being steamed and rolled into thinner flakes. They cook quickly, about 5 minutes, but their flavor and texture are a little different than old-fashioned rolled oats. 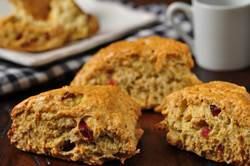 Cranberry Oat Scones: Preheat your oven to 375 degrees F (190 degrees C) and place your oven rack in the center of the oven. Line a baking sheet with parchment paper. In a large mixing bowl, place the flour, sugar, salt, baking soda, baking powder, and ground cinnamon and whisk to combine. Add the butter and using a pastry blender, or two knives, cut in the butter until it resembles coarse crumbs. Stir in the rolled oats, dried cranberries and zest. Stir in the buttermilk (adding more buttermilk if necessary) and mix just until the dough comes together. Transfer to a lightly floured surface and knead the dough four or five times and then pat, or roll, the dough into a 7 inch (18 cm) circle. Cut this circle into 8 triangular sections. Place the scones on the prepared baking sheet. Brush the tops of the scones with a little cream (helps to brown the tops of the scones) and sprinkle with a few rolled oats. Bake for about 15 - 18 minutes or until browned and a toothpick inserted into the middle of a scone comes out clean. Remove from oven and transfer to a wire rack to cool.